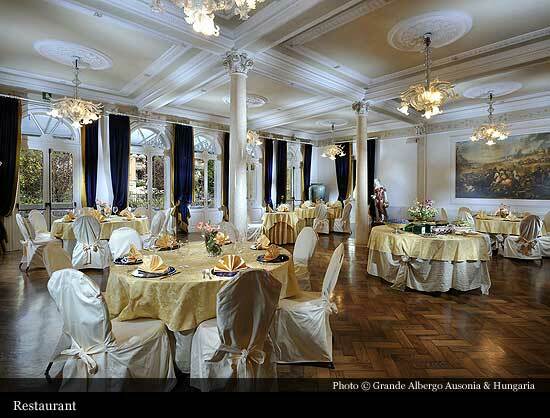 Located on the Gran Viale Santa Maria Elisabetta, the main street from the Lido landing stage to the sea front, Grande Albergo Ausonia & Hungaria was inaugurated in 1907 by the businessman from Friuli Ludovico Fabrizio. 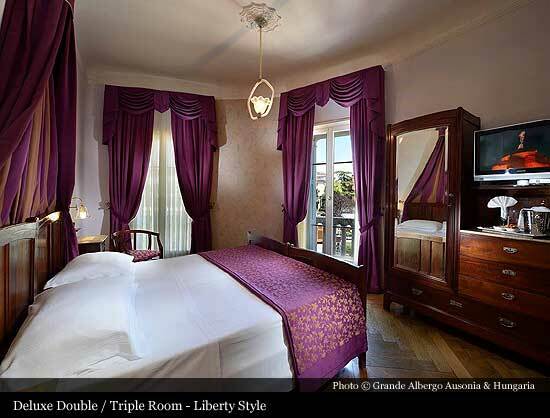 Originally named "Hungaria Palace Hotel", it was designed by architect Nicolo Piamonte. 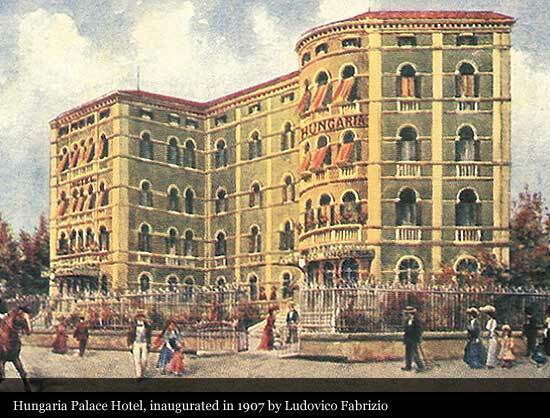 The clientele of the hotel came mainly from north-east Europe, thanks also to the fact that the Kingdom of Hungary was well connected with Venice by rail and also by sea with Fiume (today's Rijeka in Croatia). 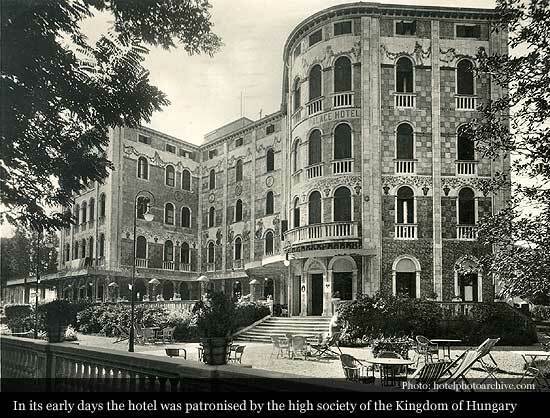 In its early days the hotel was patronised by the high society of the Kingdom of Hungary. 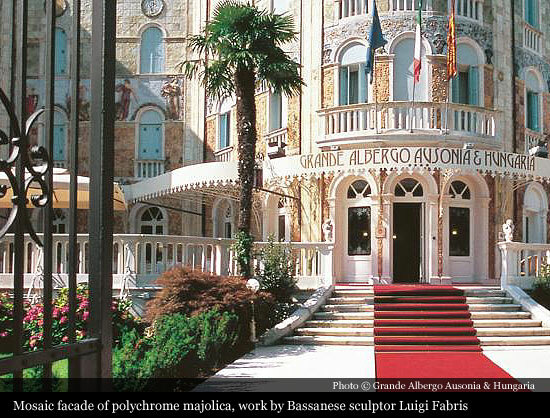 In 1913, famous Bassanese sculptor Luigi Fabris with his young colleague Doro Sebellin, created and realized complete covering of the external surface of the hotel's north-east facade, facing the Lido's Gran Viale. 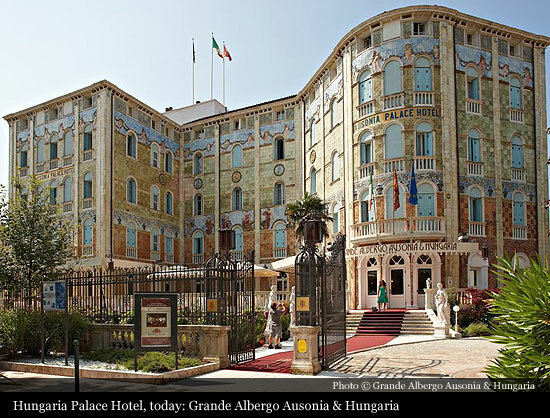 With a record size of eight hundred square metres, this extraordinary multi-colored mosaic facade of polychrome majolica feature elements of various dimensions and typologies. 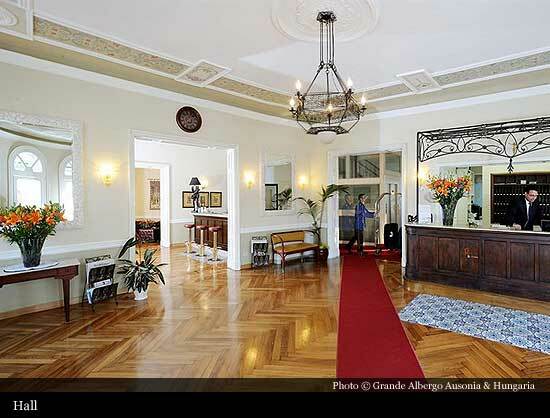 The instalation is based on neo-Renaissance decorative schemes, known also through the illustrations a la De Carolis, and consisting in strips of slabs, different according to their height, with the level of complexity increasing the higher they are. Of particular value is the strip of female figures done in bas-relief in life-size dimensions. Before retreating in April 1945, the Germans used these female figures for target practice. 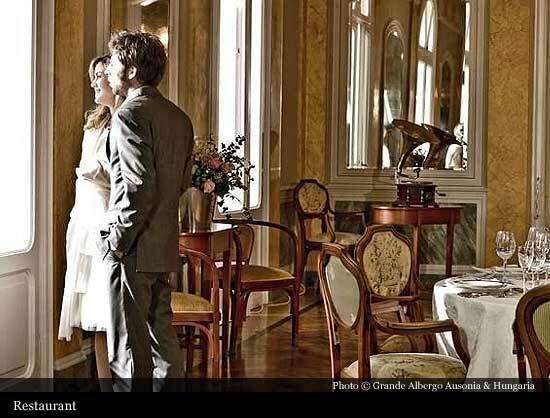 Closed during the war and reopened in 1920, the hotel was one of the key players in the season of gold of the Lido di Venezia when guests danced the night away at its elegant club, the “Follies Dancing”. 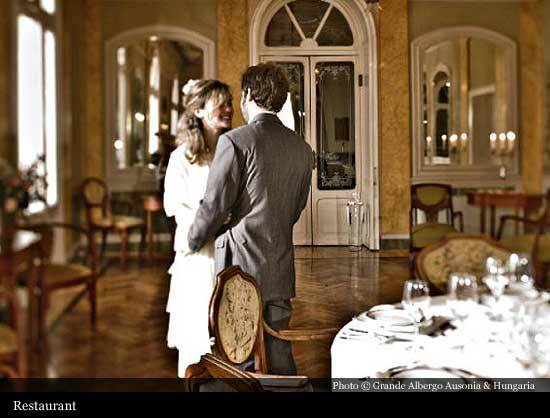 In 1920, following a conflict with Austria and Hungary, the name changed to Ausonia. 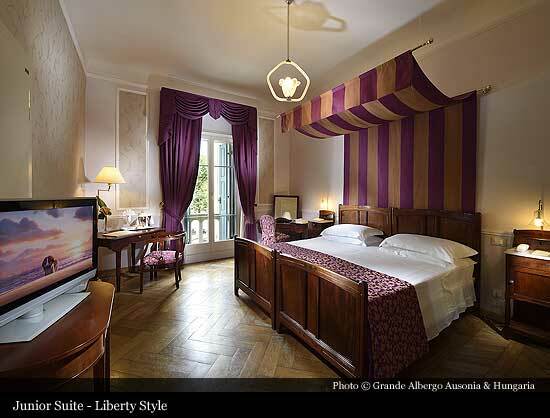 Renovated in 2011 and available in different categories, large number of guestrooms and suites has its original Liberty-style furnishings created more than a century ago by the Milan-based designer, Eugenio Quarti, which were exhibited at the prestigious Salone dell’Arte in Paris of 1907. 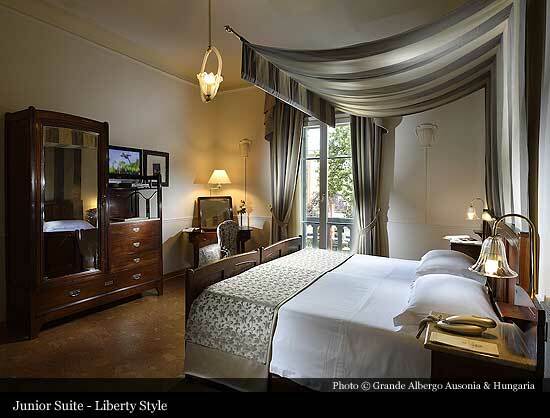 During its long history, Grande Albergo Ausonia & Hungaria welcomed: Prince Edward of England, Sarah Churchill, Claudia Cardinale, Jerry Lewis... Every year, many national and international stars select the Grande Albergo Ausonia & Hungaria for their stay in Lido during the Mostra Internazionale d’Arte Cinematografica / the Venice Film Festival.